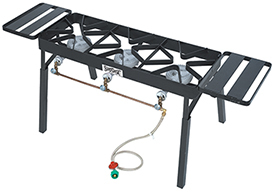 Weber Gas Grills – legendary cooking systems that have accumulated engineering accolades over many years as well as recognition for the appearance, functionality and longevity of these high-end units. Durable materials of construction, exceptional design and quality-driven construction are what make these grills stand outs in the eyes of the serious grill masters. To learn more about Weber Grills or to download brochures and manuals, please go to www.weber.com. Big Green Egg Ceramic Grills – this American designed ceramic cooker was derived from an ancient clay cooker called a “kamado”. It offers extensive cooking flexibility, noticeable moisture retention in the foods prepared, easy temperature control and overall amazing results. These units are easy to start, easy to use and easy to clean up. What more could you want? 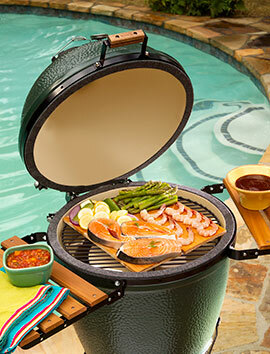 To learn more about Big Green Egg Ceramic Grills or to download brochures and manuals, please go to www.biggreenegg.com. 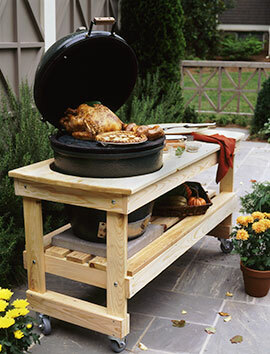 Planning a party or family gathering that your home grill can’t handle? 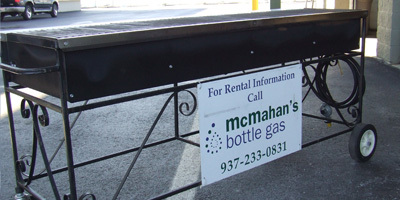 Contact McMahan Bottle Gas at 937-233-0831 or 937-274-9940 to learn more about our flexible rental grill programs. You can grill like a pro regardless of the size of your crowd with top-quality, four burner or eight burner, high capacity Lazyman grills supplied by McMahan’s. 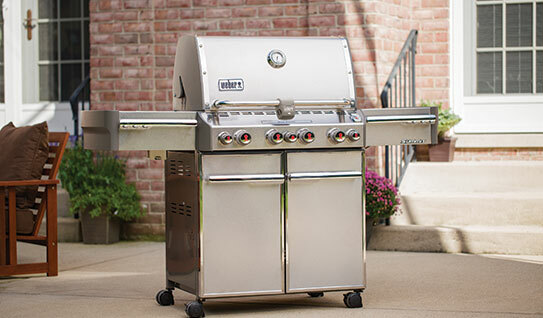 Impress your guests with one or more grills built to perform like champs. Why buy an oversized or additional grill for one or a few events when you can rent the grills that you need at a significantly lower cost? McMahan’s rental grill programs are ideal for the grill master that has all the skills… but lacks the “firepower” needed for that large family gathering. Call today! Marinades are flavor-infusing liquids used in prepping your meats for the grill. In addition to herbs, condiments, spices and oils, marinades typically include an acid, such as lemon juice, wine or vinegar. The acid goes to work on proteins, tenderizing the meat while infusing sweet or spicy flavors found in the marinade. Adding sweet ingredients to the marinade can help form appealing caramelized, crispy coatings on the meats you grill. Marinades are ideal when grilling tougher cuts of meat, contributing to a more tender and moist end product. McMahan’s offers an extensive variety of marinades to satisfy the most demanding taste buds. Whether you like it spicy or a little sweet, marinades from McMahan’s will always give you that additional boost to push your grilled meats over the edge. 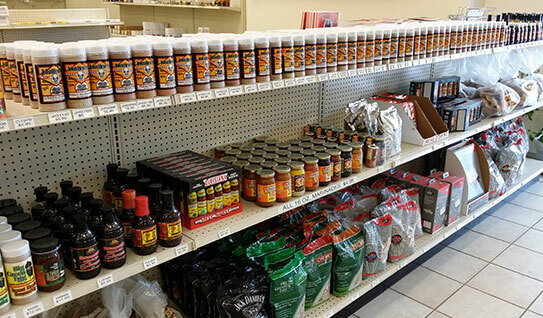 In addition to marinades, McMahan’s offers over 50 different rubs and 10 different flavors of smoking chips. With such a variety of marinades, rubs and flavor-enhancing smoking chips available at McMahan’s, you can create a different taste each and every time you grill. Impress your guests and grill like a pro with quality marinades, rubs and smoking chips from McMahan’s. Stop in today and stock up! How would you like to cook a 15 pound turkey in just 45 minutes? 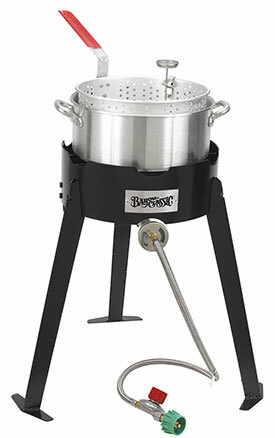 You can with a Bayou Classic propane fired turkey fryer available from McMahan’s. While deep frying a turkey may sound strange to some people, the deep fried turkey is actually moist, delicious and not greasy at all. To enhance the flavor or the deep fried turkey, you can inject it before cooking with one of your favorite marinades from McMahan’s. The concept originated in the south but has now caught on nationwide. Bayou Classic propane-fired turkey fryers are energy efficient and perfectly safe when used properly. The high quality Bayou Classic turkey fryer handled by McMahan’s features durable cast iron burners, premium construction, quick and easy assembly and they require no electricity. Contact McMahan Bottle Gas at 937-233-0831 or 937-274-9940 to learn more about energy efficient turkey fryers. Extension legs raise frame to 25"